Calf Creek Falls campground was incredible. Loved it in the day, and I was stunned by it at night. Like Castle Valley, it was far away from city lights. We slept under innumerable stars. The starry night sky reminds me that there must be a never-ending number of opportunities like Calf Creek awaiting us. 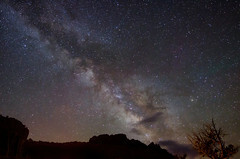 The Milky Way displays billions of awe-inspiring testaments of that fact. After a lengthy trip to some of Utah's outskirts, the highway then follows the route of the creek for most of the distance, atop the bluff to the east of the canyon. Calf Creek Campground is surrounded by green shade trees and a stream meanders through the recreation area, which lies below the valley highway. But the trip to Calf Creek was a lot longer than that. For me, it actually started more than 50-years-ago. I imagine the great family vacations and eventual move to the country had a lot to do with finding Calf Creek. You see, getting there has more to do with valuing family time and creating memorable experiences. That for me began long ago when feeling hope during some of life's most challenges times was necessary and good. Living in a comfortable situation despite circumstances is a choice. And that is why we ended up at Calf Creek Falls. It was a choice to spend time doing something good and wholesome and upright with family. ​Nevertheless, when we arrived home and unpacked the truck and trailer, finally put away our camping gear, and washed our filthy, smoke laden grubby clothing, it was sheer joy running the hot water over my head and neck and down my back. The soap and scrubbing brought life back into my aching muscles and made time even that much better for a moment. 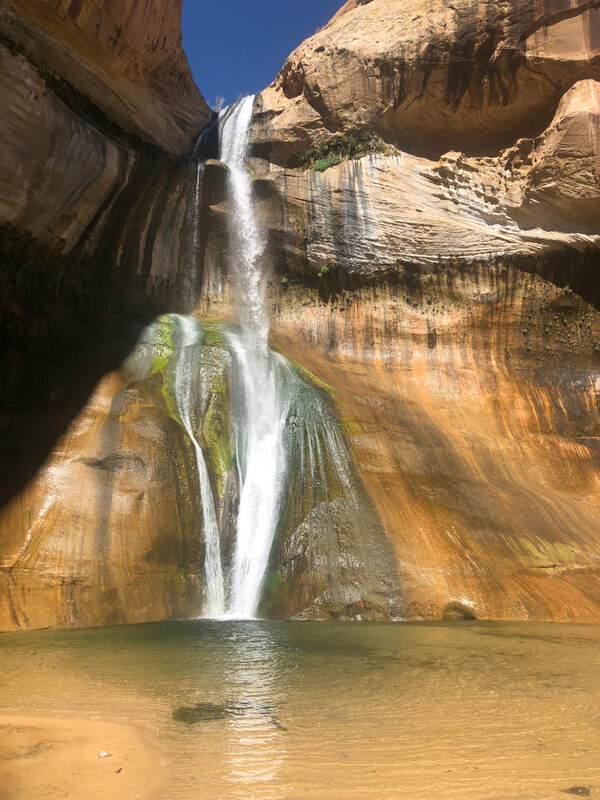 ​Calf Creek Falls is a Grand Staircase Escalante hike leading to a 126-foot-high waterfall and refreshing swimming hole. The perfect desert oasis. The campground, surroundings, and company was nothing short of unbelievable. Heaven on earth. Perhaps I am the luckiest man alive. No. I didn't earn it. I don't deserve it, but I've got it all the same...family.